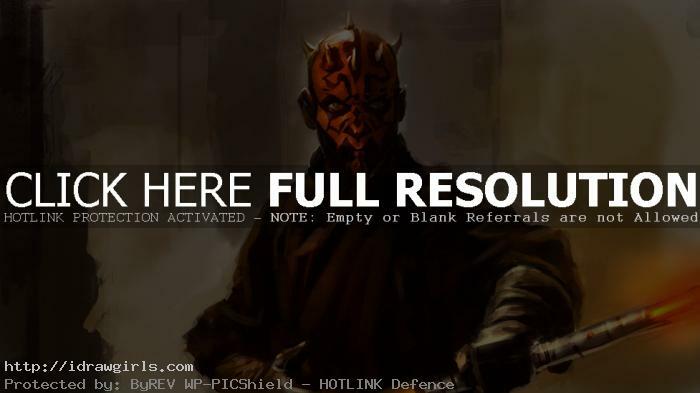 Digital painting tutorial Darth Maul from Star Wars. 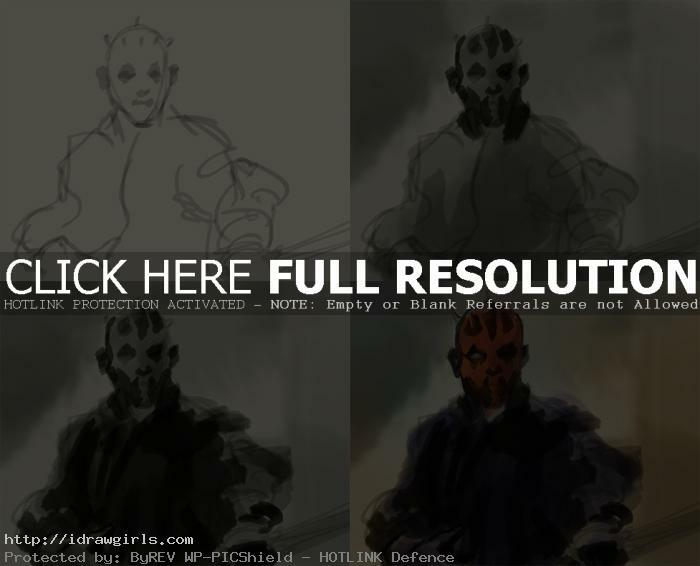 This video shows you how to paint Darth Maul from sketch to painting. Here is another digital painting tutorial on how to paint a character using Photoshop and Wacom Intuo tablet. 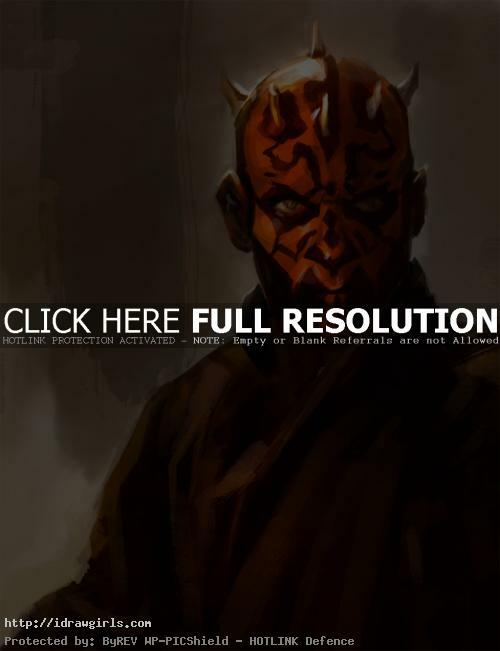 Learn to paint Darth Maul from video lesson and step by step images with instruction. You will learn how to paint a character focusing on light and shadow. You can scroll down below to see step by step images with instruction. I know this might sound a bit odd, but this is the method that is widely used by most concept artists for video games and movies. The method of painting will provide you the more dramatic and accuracy for your illustration and concept art. This style, I believed, is strongly influenced by John Singer Sargent, Ander Zorn then later Richard Schmidt and Craig Mullins. It begins with impressionist approach (digital speed painting) then end up with realistic result focusing on light source. Though John Singer Sargents’ work can be described as examples of Realism. His lack of use of under painting and under drawing allowed for more spontaneous, less controlled brush strokes which gave the effect of capturing the sitter in a candid moment. It is one of the fastest and most accurate way to paint. This style of painting has three primary focuses for beginners. There are actually more rules and principles. But if you can master just these three objective in your painting, you can make it looks extremely realistic within a lot less time spend painting. First is correct drawing or shapes. Second, the value (light and shadow) must be as accurate as possible. This includes hue (color) along with its shade of light. But for beginner painter, I suggest paint with monochromatic until you get a hang of value. Third, you have to make use of three edges (hard edge, soft edge, and lost edge). You can go read Three important rules of painting for more detail. Darth Maul was a male Dathomirian Zabrak Dark Lord of the Sith who lived during the waning years of the Galactic Republic. By the time Maul was an adolescent, his Master had already forged him into a weapon of pure hatred. He had a sense of honor, however, respecting those he deemed worthy opponents and granting them quick deaths. At the time of the Invasion of Naboo, Maul was dispatched to eliminate the Jedi who had been sent by the Republic to settle the conflict. In Naboo, vicious duel against both Qui-Gon Jinn and his apprentice, Obi-Wan Kenobi—Maul showed his true mastery of the lightsaber arts. 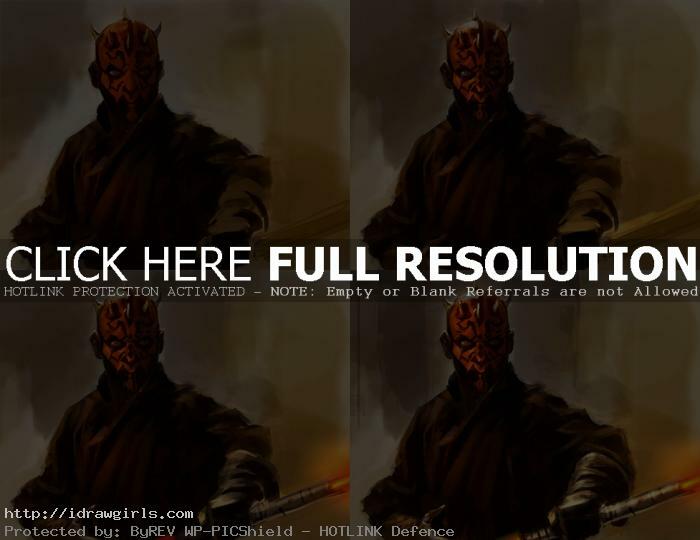 Below are step by step how to paint Darth Maul. Step one, I started off with rough figure sketch of his head, body and arm. Step two, I painted medium gray onto the figure and background to establish base value. Step three, I add dark gray on his coat and part of his face. Step four, I then has two to three basic value so I paint color base on top of the existing painting with majority of red on his face. Step five, I paint detail on his face and part of his wrinkles on clothing still in the middle range value. Step six, I added lighter value on his head, face and part of his gloves. Step seven, I painted more highlight on gloves and light saber. Final step, I found a few hot spot to add final lighting onto the figure and painted part of the background. Done! Do you work at 300 ppi or 72 ppi? Hey Xia, When doing a study, whats the best way to make it stick in your head? I did alot of studies which I did pretty good on i think, But then a week after having done them, I cant seem to draw/paint what I studying nearly as well without reference. But the whole point of studying is so you no longer need photo reference. http://jones0da.deviantart.com/ all my studies are there, I havent uploaded anything since becuase of that problem.